Posted: December 27th, 2012 under ApSIC Xbench. We’ve just uploaded to YouTube the first demo video on Xbench 3.0 search basics. A few more demo videos will be posted in the coming weeks to help you get started with Xbench. This 5-minute demo video is a version updated to Xbench 3.0 of one the Xbench 2.9 videos that were also posted on YouTube a couple months ago. For the best viewing experience, please watch it at full screen in 720p. Posted: December 20th, 2012 under ApSIC Xbench. We have just added PayPal as a payment method to purchase ApSIC Xbench 3.0 subscription years. Please note that even if you are an individual, you may purchase several years at once to benefit from the BETA promotion pricing for a longer period of time (up to 10 years per individual). Share-it (Digital River). Share-it is a reseller based in Germany, so if you are tax resident in the EU and not elegible for VAT exemption, your VAT will be 19% (German VAT). PayPal. This is the only current option to make a purchase with a free email address such as gmail.com or hotmail.com. In this case, ApSIC, based in Spain, is the seller, so if you are tax resident in the EU and not elegible for VAT exemption, your VAT will be 21% (Spanish VAT). You can make payments using any of the above methods, or both, and your purchased subscription years will be linked to the email address that you use for your purchase. With the upcoming License Manager, you can later distribute those purchased years among any other email address, and you do not have to allocate any time to the email who made the purchase if you don’t want to. 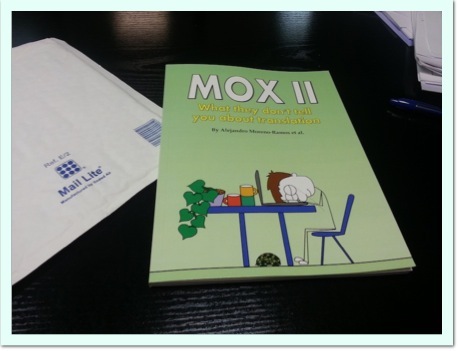 Great Christmas Present from Mox to the Xbench Team! Posted: December 19th, 2012 under ApSIC Xbench. It is a real pleassure to be able to relax little bit and have some fun with Mox and his motley crew after the stressful release of Xbench 3.0 beta last week. This book rocks big time, and you can get your own copy, or surprise a friend with a great Christmas gift here. Posted: December 18th, 2012 under ApSIC Xbench. We did not realize that with ApSIC Xbench 3.0 we were also introducing something unconventional: we invented a license model totally different from anything else in the market. From early feedback, we noticed it was not clear to users what happens exactly if you buy more than one year. Quite a few users thought that since they needed only one user, they could buy only one year now and then wait for a year for the next payment. If you are a single user and you buy 5 years now for €95 (5x€19), you get a license until around January 2018 (i.e. release date of January + 5 years). It seems to us a good simulation for a permanent license. If you run a multi-user organization and buy 5 years, you can distribute these 5 years among any number of users. This is a subcription model, and when your purchased time expires, you cannot continue running the program. When your purchased time expires, you can run instead Xbench 2.9, which is freeware, and also a great tool. You cannot assign a user more than 10 years. So if you have a multi-user configuration and buy 30 years, you will need to assign at least 3 users with 10 years each. The Xbench account that you use to buy time, does not need to be the one that uses the time you bought. You need to have at least one user but you can add and remove users as you need. When you do so, the end of your subscription will be shifted accordingly. Therefore, if you would have bought more than year if you knew you could, you can now simply make a second order at www.xbench.net with the same email you used for your first order and the additional time will be added to your account. Posted: December 14th, 2012 under ApSIC Xbench. For many years, we’ve seen Xbench has been as a symbiotic product. External users provided very helpful feedback that allowed us to improve a tool that is essential for ApSIC own production processes as an LSP. At the same time, external users benefit from using a great tool. However, as the Xbench user base grew, tensions on the feature set appeared. There were many user suggestions that, although they were useful for users in general, we were reluctant to implement because they were for a CAT tool that ApSIC did not like anymore (or did not like enough yet), or they were for needs that we had already covered in some other way, or they were needs that we simply didn’t have. Indeed, the main feature of ApSIC Xbench 3.0, Unicode support, was probably something that we at ApSIC could get by without it because of the main language pairs we focus on. So with this release, we’ve made an important decision: we will no longer require that any change to ApSIC Xbench has to be fully symbiotic with ApSIC’s needs as an LSP. We believe that this decision will greatly contribute to enhance the support of some formats whose functionality was not at par to other formats more important to ApSIC’s daily production. With this decision — and therefore without this restriction — we can now fully focus on making Xbench a great tool for even more users. However, in order to maintain a proper motivation for its development, this decision means that Xbench 3.0 will become a paid product. With Xbench 3.0 we are introducing a flexible subscription model based on named users, where your email is the Xbench account you use for your license. This means that you can install Xbench on as many devices as you wish and simply sign in to use Xbench. No device activation, no license returns, no lost licenses in crashed disks. A subscription model also means that we will take care of existing users with the same priority as new users because the monetary reward for a renewal is exactly the same as for a new user. It also means that we will not pester you with exploding upgrade offers because, with a subscription model, you are always entitled to any upgrade. So, what’s the price going to be? During the beta period, Xbench 3.0 will be free of charge. Once the beta finishes, one entitlement (license to run one copy on any device) to Xbench 3.0 will be €99/year. The beta program is public. To join the beta program, simply go to the new home of Xbench at www.xbench.net, download Xbench 3.0 and after installing and starting it, click the Sign Up link in the Sign In dialog. Xbench 2.9 will continue to be freeware, and will also have its home at www.xbench.net. We sort of picture the role of Xbench 2.9 as the Lite version of Xbench 3.0, because a lot of the functionality is already there, although we believe that Xbench 2.9 is also a Pro version for its own merits. We did not want to create a crippled Lite version of Xbench 3.0 because it could mean losing focus on the Pro, and we believe that trying to make Xbench 3.0 a great product is difficult enough! We’re looking forward to your feedback on the beta, which you can report in the Contact Support page at www.xbench.net.